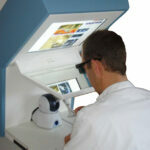 Voxel-Man is a pioneer in medical visualization and simulation technology. 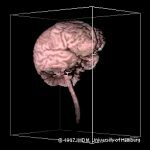 The Voxel-Man project dates back to around 1984, when a research group headed by Professor Karl Heinz Höhne at the University Medical Center Hamburg-Eppendorf made their first experiments on 3D visualization of tomographic images from CT and MRI. At RSNA 1987, the first ever in vivo images of a complete human brain could be presented. In the 1990s, a new kind of interactively explorable virtual body model was developed, which integrates spatial and descriptive knowledge of human anatomy, function, and radiological appearance. 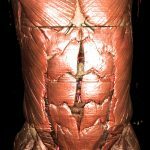 This framework proved a perfect match for the highly realistic, full color 3D renderings created from the Visible Human cross-sectional images of the U.S. National Library of Medicine. Among others, these works led to the anatomy atlases Voxel-Man 3D-Navigator: Brain and Skull, Inner Organs and Upper Limb (all published by Springer) and EUS meets Voxel-Man, a training system for endoscopic ultrasound (published by Hitachi Medical Systems). Applications outside the medical domain include the Virtual Mummy and the Visible Animal Project. Around 2000, experiments with the newly available force feedback devices showed their potential for medical applications. In close cooperation with clinical partners, a first prototype of a surgery simulator for temporal bone dissection was developed, which combines unsurpassed visual realism and haptic feedback. In 2005, the Voxel-Man Group was established and the Voxel-Man TempoSurg simulator was introduced to the market. 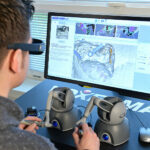 In 2009, the Voxel-Man Group received an EXIST-Forschungstransfer grant from the Federal Ministry of Economics and Technology (BMWi) for the development of a dental simulator. Its completely rewritten basic design provides the common platform for all Voxel-Man training simulators. In 2011, the second generation of the temporal bone drilling simulator called Voxel-Man Tempo and the tooth preparation simulator Voxel-Man Dental were presented, later followed by Voxel-Man My Cases for importing clinical cases from CT into the simulator and Voxel-Man Sinus for endoscopic sinus surgery. All software updates published since 2012 were provided free of charge. Today, Voxel-Man surgical simulators are used by leading universities and hospitals around the world, from Honululu in the west to Tokyo in the east and from Örebro in the north to Porto Alegre in the south. The growing interest in our simulators is also reflected by a considerable number of independent validation studies. … and what is a voxel? A volume element or voxel is the elementary component of a digital representation of a three-dimensional object, similar to a picture element or pixel in a two-dimensional image. Voxel-Man refers to the digital representation of the human body.